In 1997, the Rockdale Youth Baseball Association’s coach, Eddie Bagwell invited the first disabled child, Michael Moore to play baseball on his team. Coach had watched this seven year old in his wheel chair attend every game and practice to cheer on his five year old brother–and yet he couldn’t play America’s favorite pass-time. And in 1998, the Rockdale Youth Baseball Association (RYBA) formed the Miracle League to further its mission of providing opportunities for all children to play baseball regardless of their ability. The disabled children in the community had expressed the desire to dress in uniforms, make plays in the field, and round the bases just like their healthy peers. The league began with 35 players on four teams. The main concern was that the Miracle League teams played on the same grass fields as the RYBA teams, presenting potential safety hazards for players in wheelchairs or walkers. In its spring, 1999 season, the Miracle League gained support and became a source of pride for all involved as participation grew to over 50 players. During that season, the magnitude of the need for such a program was recognized. It was learned that there are over 50,000 plus children in Metro Atlanta who are disabled to some degree that keeps them from participating in team sports. That is when the dream of building a unique baseball complex for these special children was conceived. The Rotary Clubs of Rockdale County and Conyers stepped forward to form the Rotary Miracle League Fund, Inc., a 501 (c) 3 organization. The new organization had two objectives: (1) raise the funds necessary to build a special complex with facilities that meet the unique needs of the Miracle League players, and (2) assist in the outreach efforts for the Miracle League. The Miracle League complex was completed in April 2000. 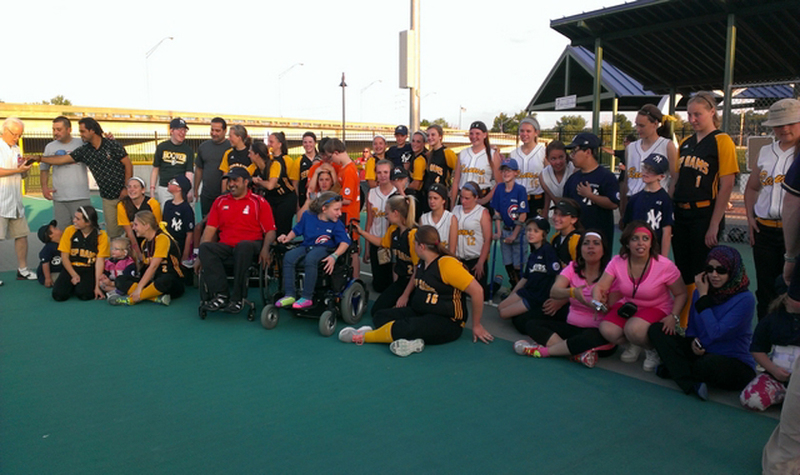 On opening day, the Miracle League rosters had grown to over 100 players. The players raced around the bases and chatted with their teammates in the dugouts as they celebrated. Nicholas Slade, a player who had been in a coma just a week before, threw out the first ball. The players’ enthusiasm has continued to grow. By spring, 2002, over 250 players filled the Miracle League rosters. The parents tell stories of their children insisting on playing despite bouts with kidney stones, broken bones, and recent hospitalizations. The thrill of playing, the cheers from the stands, and the friendships they develop make the Miracle League Field an oasis away from their everyday battles. In its first season, there were no programs to copy. It was decided that each player would bat once each inning that all batters would be safe and score a run before the inning was over. Each team and each player always wins. Our umpire describes this as the only league where no one ever gets mad at him or her. “Buddies” assist Miracle League player. These buddies are mainstream children who play baseball, youth church groups, boys and girls scouts to mention a few. As a result, the parents, children and volunteers are all brought together – special need and mainstream alike-in a program, which serves them all through service to children with special needs. The program is opened to children from any community and, until December 1, 2001 was one of a kind. The Miracle League has received local and national media attention. The league has been chronicled in the local newspaper, televised both locally on NBC, ABC Connecting With Kids and FOX Atlanta affiliates and nationally on CNN, MSNBC and Fox Sports. In July 2001, the league was profiled on a segment of HBO’s Real Sports. Articles profiling the league appeared in People, Family Circle and Rotary International magazines. In January 2002 two men from the Miracle League were awarded the Martin Luther King Humanitarian Award and on January 24th PAX TV’s “It A Miracle” told the story of Conyers Miracle League Player Lauren Gunder. February 2002 the Miracle League Players were featured in Rotary Internationals’ PSA, chosen out of 500 applicants. Winter of 2002 the Miracle League again was profiled in the Georgia Tech Alumni Magazine. January of 2002 won the 11ALIVE TV Community Service Award and June of 2002 took the Jefferson Award, The American Institute for Public Services, founded by Jacqueline Kennedy Onassis and Senator Robert Taft, Jr. The publicity from these media events, coupled with positive word of mouth, raises awareness among the families of special need children and allows the Miracle League Association to take the program across the country. Presently there are 180 Miracle League Organizations across the country including Puerto Rico, 80 completed rubberized fields, and 100 fields under construction. The Miracle League is proud to serve over 25,000 children and young adults with disabilities. The Kiwanis Miracle League at Principal Park will be the first field in Iowa–with hopefully more to follow! Nationally, the goal is for 500 Miracle League fields including several international locations. Approximately 1.3 million children will be served. This goal is being realized with the help of communities, volunteers, parents, donators, individual sponsors, and corporate sponsors. “Every Child Deserves A Chance to Play Baseball.